btw: it's also handy to just keep used office printer paper in a big drawer too. I still have stacks of it, and have a hard time throwing away any properly sized paper because "Hey that looks like it would make a good airplane". Get him some 11x17! You can start making good stuff with that. Also, for variety, a fun thing to do is to start taping together multiple 8.5x11 sheets into BIG sheets, and making the largest airplane possible. Warning: use light tape, heavy tape will make the plane too heavy to fly far. I think my record for a usable airplane was from 16 sheets taped together. 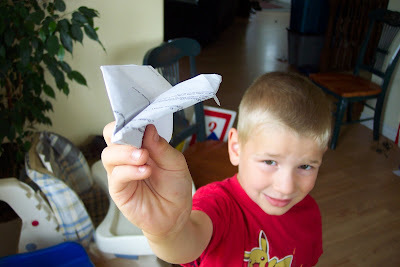 I used to make paper planes and boats all the time in Calcutta. We used to fly the planes and drop the boats from the balcony into the air and into the flooded street (Hoorah for Monsoons) below respectively. These simple past-times make the max. memories for years to come. 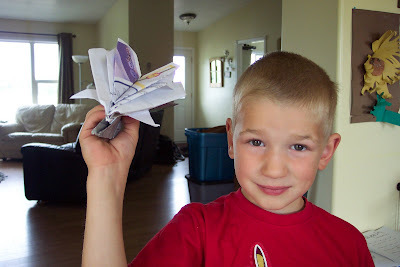 So glad the kid's having a brilliant time with them and a paper plane making book? Now I need to get one of those!! How great that a fun activity is also a good learning activity! Logan - I DO remember, actually, and had told Jude about your adventures. He thought that was pretty cool. He has invented his own "transformer plane" that can have either a blunt or a pointy tip--and flies pretty good either way! 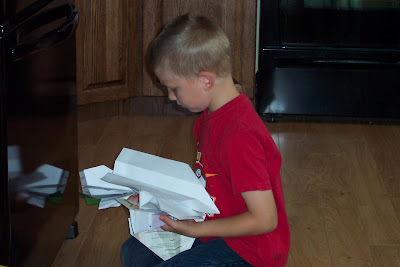 And I always keep reusable office paper around for the boys--the best way to recycle before I recycle, if you ask me! Ace - Oo, that sounds like a blast! 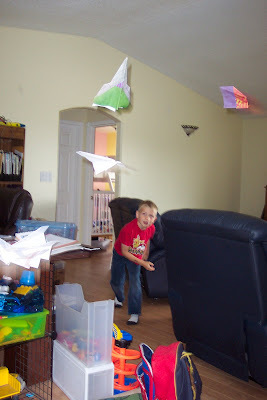 The boats got to fly before they floated! Hee. Definitely get a book--although with your engineering mind, you probably don't need one!